In classical scheduling problems, we are given jobs and machines, and have to schedule all the jobs to minimize some objective function. What if each job has a specified profit, and we are no longer required to process all jobs? Instead, we can schedule any subset of jobs whose total profit is at least a (hard) target profit requirement, while still trying to approximately minimize the objective function. For the minimum average flow time problem on identical machines, we give an LP-based logarithmic approximation algorithm for the unit profits case, and complement this result by presenting a matching integrality gap. For the average weighted completion time problem on unrelated machines, we give a constant-factor approximation. 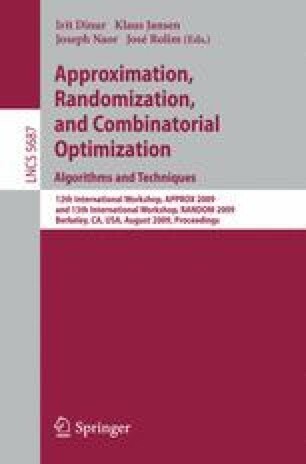 The algorithm is based on randomized rounding of the time-indexed LP relaxation strengthened by knapsack-cover inequalities. For the generalized assignment problem with outliers, we outline a simple reduction to GAP without outliers to obtain an algorithm whose makespan is within 3 times the optimum makespan, and whose cost is at most (1 + ε) times the optimal cost.